Crooked Lane Books, 9781683311393, 304pp. A murder aboard a steamboat forces Abraham Lincoln to make a fateful choice--one on which the future of the nation may hang, if his client doesn't first--in this gripping follow-up to critically acclaimed author Jonathan Putnam's "masterfully crafted" (Alex Grecian) debut, These Honored Dead. Newly minted trial lawyer Abraham Lincoln is riding the circuit, traveling by carriage with other lawyers and a judge to bring justice to the remote parts of Illinois. Meanwhile, Lincoln's close friend Joshua Speed steams up the Mississippi River aboard a steamboat owned by Speed's father. Suddenly, his journey is interrupted when a rigged card game turns to violence--and then murder. Speed enlists Lincoln to defend the accused, but soon they come to discover that more than just the card games are crooked aboard the Speed family's ship. As the day of judgment hurtles toward them, Lincoln must fight to save the life of his client while also preserving the cause he holds so dear. 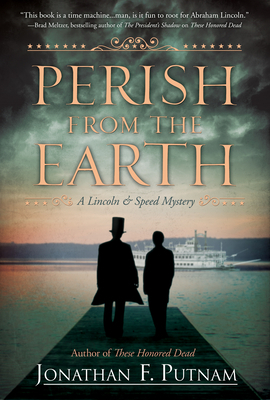 Meticulously researched and deftly plotted, Jonathan F. Putnam's second Lincoln and Speed mystery, Perish from the Earth, revolves around a true historical murder that, while nearly forgotten today, was one of the most infamous crimes of the nineteenth century and played a key role in driving the nation toward civil war. Jonathan F. Putnam is a writer and attorney. A graduate of Harvard College and Harvard Law School, he is a nationally renowned trial lawyer and avid amateur Lincoln scholar. He currently lives with his family in London, England. This is his second Lincoln and Speed mystery following These Honored Dead.